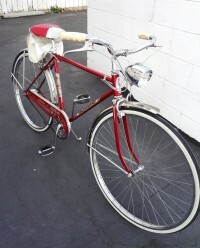 Take a look at this near-mint condition 1961 Schwinn Traveler! 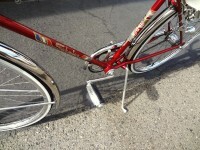 Painted “Radiant Red” with the original decals, polished stainless-steel fenders, rare plastic “star burst” head-badge and whitewall tires, this bike looks amazing! 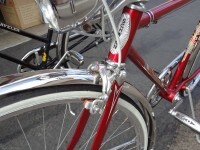 The rear hub is a Sturmey-Archer 3-speed. 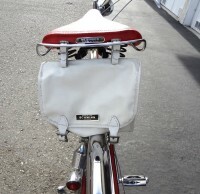 It has hand-brakes, front and rear with the “Schwinn Approved” script embossed into them. Even the original headlight and an accessory cargo-bag are still intact. These bikes rarely survive in this condition. It looks as though it has barely ever been ridden! 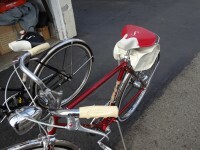 Would you like to own and ride a bike like this? I know I would!